This week it's my suggestions of perfect gifts for Little Girls! All of the items included can, of course, be suitable for little boys too! Every time the ad comes on TV, my 3 year old and 6 year old nieces shout out in unison "I want that! I want that!" So I was very intrigued to be able to take a look at Baby Chou Chou to see if I thought it was worth the hype, as personally I buy my nieces a doll most years and I often feel disappointed with them once they're out of the box! The doll, on first inspection, is everything you would expect - a very cute looking baby doll. She bares a striking resemblance to the Baby Born dolls though I think she is slightly smaller. The dolls comes with an adorable pink floral dress and hairband, very sweet and I know that my nieces greatly appreciate dolls that they can dress and undress rather the ones with clothes attatched. What makes Chou Chou different is that she is poorly and she needs her new Mummy to make her better! When Chou Chou cries, her cheeks turn bright red - there are various accessories that come with her which her new little owner can use to make her feel better. She has a heart shaped dummy which can be used to take her temperature, a heart shaped stethoscope so that allows you to check her heartbeat, and a special medicine spoon which makes her better. Once she is better, press her tummy and she laughs - letting you know she is feeling much better! My only slight critique would be the name of the doll - I know that when Tyne is older I fully intend to buy dolls for him if he likes them, so using the term "Mummy" in the name eliminates 50% of the potential market - but other than that, the doll is delightful and would provide hours of fun for any little person who likes to look after babies and play the parent/Doctor! Blue Nose Friends are a range of completely adorable cuddly little friends which any child would fall instantly in love with as they are just so darn cute!!! 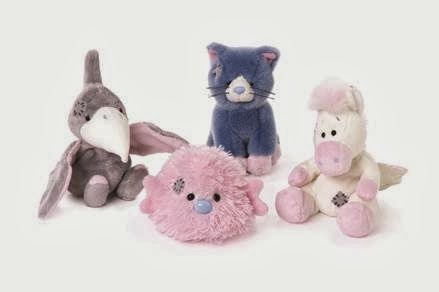 The new range of Blue Nose Friends include: Glide The Pegasus, Crest The Pteradon, Pout the Puffer Fish and Abbey the Kitten. The cuddly, fluffy toys are quite small - approx 4 inches, perfect palm-size for children - Tyne loved them and seemed to favour Crest! Perhaps because he had a long nose to chew on, but still! The toys are all adorable and with an RRP of just £5.99 each, they would make delightful stocking fillers for any little person this Christmas! I have never come across anything quite like the Story Buddies before, I find them so impressive! They are a range of super cute fluffy toys with an accompanying book. 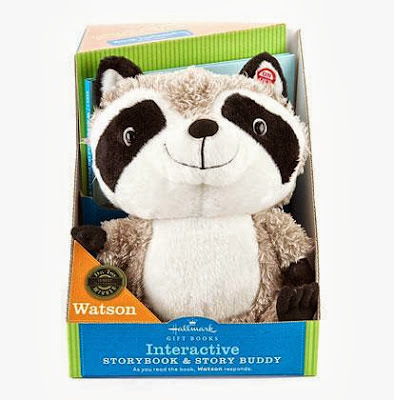 When you turn on the Story Buddy and read the book aloud, the Story Buddy chimes in every now and then with a comment or remark on what you are reading and helps you with the story!! There are keywords within the stories which activate the Story Buddy, the keywords are printed in bolder text within the book so you know when to expect the Story Buddy to chime in. We received Watson the Raccoon to try out and I absolutely love him! The story he comes with is great fun, and Watson worked perfectly every time - never missing his cue! There are two other Story Buddys available - Abigail the Super cute pink Bunny, Cooper the Teddy Bear and Bigsby the Lovable monster! What's great about these gifts is that more books are available which are compatible with the story buddy! Wow Toys offer an extensive range of imaginative play toys for children - ranging from construction toys and farm toys to fairytale toys. We were sent the Pippa's Princess Carriage to try out and were extremely impressed! 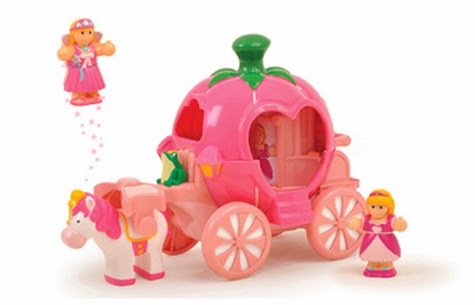 Containing a little Princess Pippa figure, A fairy godmother, a horse and a pretty pink pumpkin carriage. The carriage opens out to show Princess Pippa's dressing room and dance area. The set is absolutely delightful, and Lottie (aged 3) had loads of fun playing with Pippa and The Fairy GodMother. Don't forget to check out my Guide For Food Lovers and Guide for Sisters!